Ian Hook, Sydney 10/03, bought at BSA Autumn Show '03 (Andy Staelens). 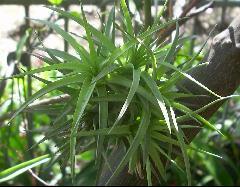 Tillandsia bergeri Mez, Repert. Sp. Nov. 14: 254. 1916. 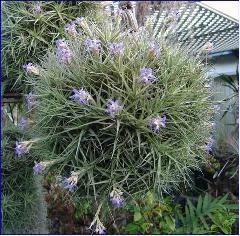 Tillandsia dianthoidea var grisea Guillaumin. Bull. Mus. Nation. Hist. Nat. II. 19: 353. 1947; without Latin diagnosis. Based on cultivated material including some so labeled in Marnier-Lapostolle Hortus. 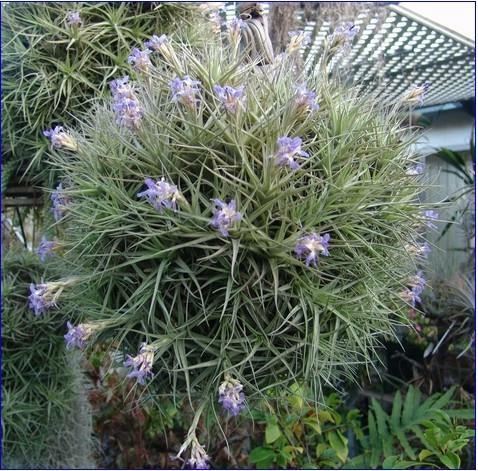 Plant caulescent, rather stout, flowering to 18 cm high. Blades suberect, very narrowly triangular, 5 mm wide, channeled. 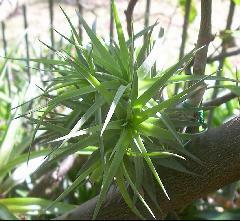 Scape-bracts erect, imbricate and covering the scape, rose, densely lepidote. Inflorescence simple, of 7-12 polystichous flowers, dense at first, elongating at anthesis, to 7 cm long, laxly cylindric, equaling the leaves. Stamens included; filaments faintly plicate; anthers 2 mm long. Type. Berger s n (holotype B, B photo 124917), probably from the vicinity of Buenos Aires, Argentina, cultivated in Hanbury Hortus, La Mortola, Ventimiglia, Italy. DISTRIBUTION. Saxicolous, to 75 m alt, Province of Buenos Aires, Argentina. ARGENTINA. BUENOS AIRES, Mar del Plata: Sierra Peregrina, 15 Nov 1929, Garcia (Senorita) s n (SI); 11 Dec 1938, Eyerdam, Beetle & Grondona 23658 (GH, NA, UC); Tandil: Cerros de Tandil, 30 Dec 1960, Fabris 2598 (LP, US); Balcarce: Sierra La Barrosa, 31 Oct 1965, Cabrera et al 17078 (LP, US); Sierra La Vigilancia, I Nov 1965, Cabrera et al 17115 (LP, US). 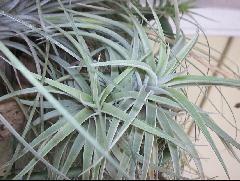 118.Tillandsia dianthoidea Rossi var. 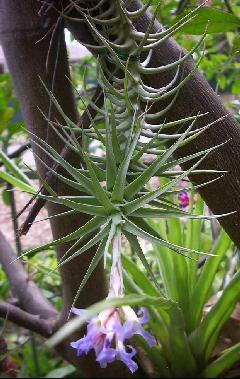 grisea Guillaum. var. nova. The scape bracts and the floral bracts are noticeably the colour of those of the type, the petals, instead of being an intense purplish blue (cfr. LOISELEUR - DESLONGCHAMPS: Herbier general de l’amateur, V, t. 304, Botanical Register, XVI, t. 1338, Revue horticole, LXXVII, p. 463), are of a dull slate grey, when one regards in minute detail, the many, and minuscule purple points on a white base very lightly tinted with blue (Marnier, f. 15, 1947) who had it at the Villa Thuret in Antibes for 7 or 8 years. 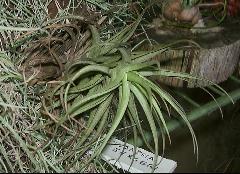 Tillandsia bergeri, a Many Splendored Species by Robert W. Read in J. Brom. Soc. 38(4):147-9. 1988. A sizeable collection of plants of Tillandsia bergeri was imported from Argentina during the summer of 1981 (December and January in Argentina). The variation observed as they came into flower effectively illustrated a point that I have often stressed: variability among individuals of a single species over the range of population. This condition is clearly illustrated in the accompanying photograph (fig. 1). These three plants represent a cross section at selected points in the variation, with numerous intermediates blending form and color throughout the collection. 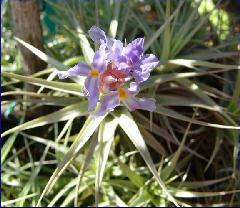 They also represent a random sampling of the population, since the plants were not in flower when originally collected. 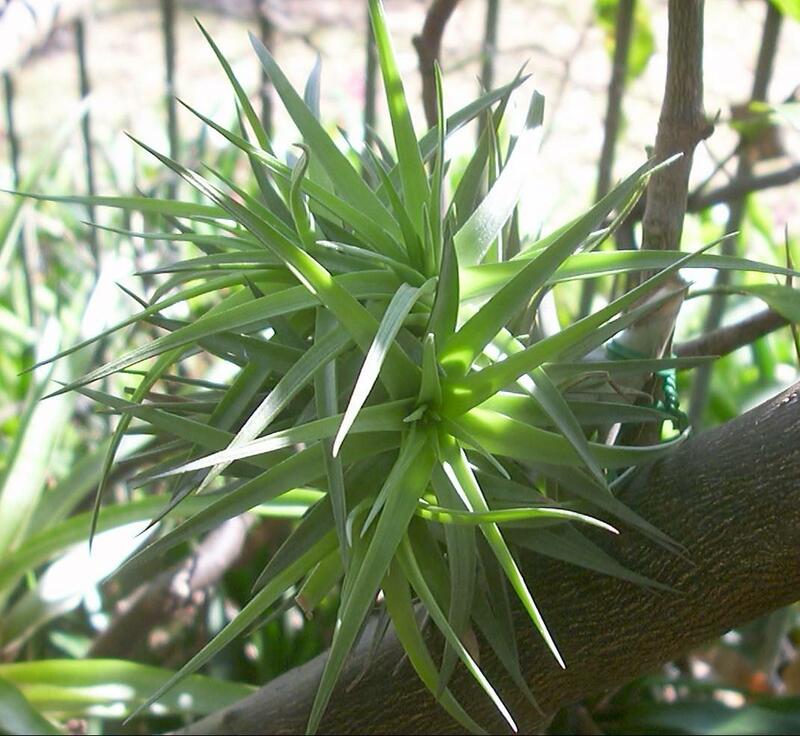 Large clumps of T. bergeri were found growing on and between granitic rocks protruding from a dusty, reddish soil 400 km northeast of Buenos Aires. Although T. bergeri is reportedly from Argentina only, T. aeranthos is widely known through southeastern Brazil, Paraguay, Uruguay, and northeastern Argentina. 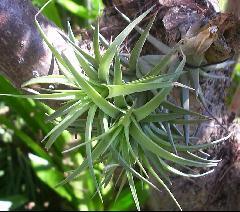 Tillandsia bergeri is a member of the subgenus Anoplophytum in a group of species distinguished by the fact that the stamens are included deep in the throat of the flower, with the style slender and much longer than the ovary; the stamens about equaling the claw of the petal, and the filaments strongly plicate in many species. 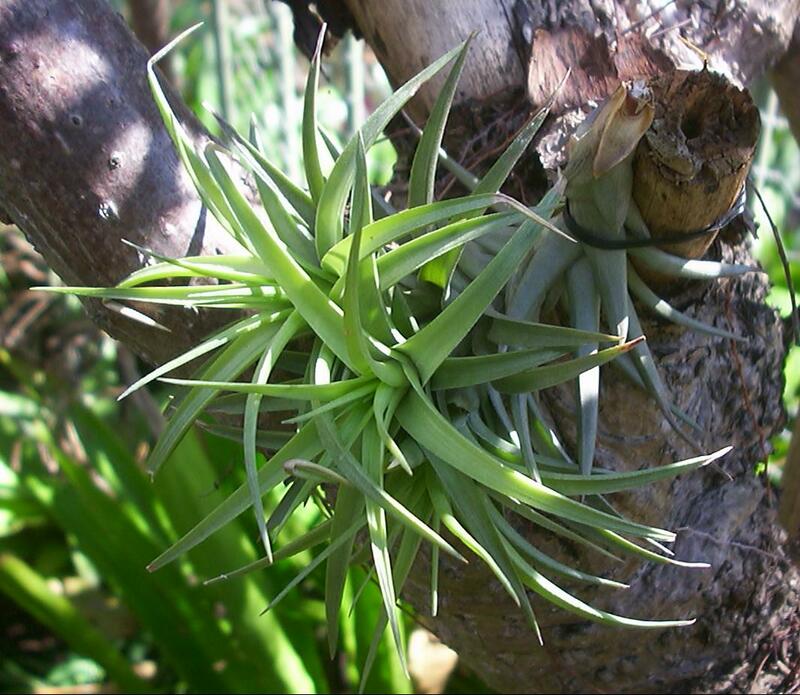 T. bergeri keys out next to T. aeranthos (Loiseleur) L.B. Smith on page 689 of Smith and Downs (1977) where it is distinguished solely on the colour of the floral bracts ("pale rose" in the former, "dark red" in the latter) and the petals ("dull blue to white" in the former, "dark blue" in the latter). However, in the text description, T. bergeri (p. 837) is said to have stamen "filaments faintly plicate," while T. aeranthos with its nine synonyms of species and varieties has stamen "filaments plicate." In the three specimens illustrated here I found no indication of plications immediately after full anthesis, with only a suggestion of plications in a couple of buds. In his new book on tillandsias, Paul Isley (1987) also makes a point of stressing how indistinguishable these two species are in the vegetative or non-blooming state. Of particular interest here is the extreme variability of Tillandsia aeranthos and T. bergeri whose ranges overlap. Plants with pale bracts, narrow white petals and nonplicate stamen-filaments show one extreme; plants with dark red bracts, deep blue, broad-bladed petals and faintly plicate stamen filaments display another. Could this represent another case of putative hybridization and resultant hybrid swarm over a large area? Are T. aeranthos and T. bergeri really distinct species, or does the former merely extend the range of variability of the latter? These questions might be answered best by someone living in the region where they grow so that random collections and measurements could be made and perhaps other more sophisticated research could be undertaken. Michael Rothenberg, who supplied the plants for this study, suggested that a comparison of the wavy versus rigid character of the petals of the two species might provide some useful information. Both T. aeranthos and T. bergeri are illustrated in the book of Alberto Castellanos (1945) (fig. 2). Adaptations of these marvelous paintings were reproduced in Smith and Downs (1977) in fig. 264, along with an example from Botanical Register (pl. 1338) (fig. 3).